The pattern forming in Tanzanian Royalty is now suspected to be a very bullish "running Flag", which is an upwardly skewed Flag. If so we are at a good entry point here with the price close to its lower boundary. So it is considered to be time to buy back whatever you sold close to the peak about 4 days. IMMEDIATE STRONG BUY AGAIN. Keep in mind that the upside potential of this stock if gold proceeds to break above $1400 is HUGE. Tanzanian Royalty TRX, TNX.TSX, closed at $0.575, C$0.76 on 21st February. 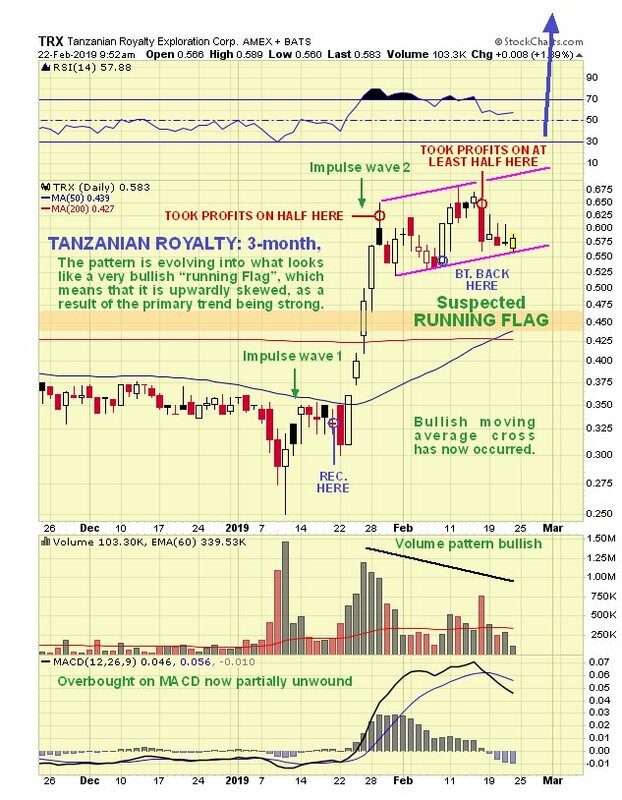 As promised in that alert we will now proceed to look at the latest 3-month chart for Tanzanian Royalty on which we can see the presumed bullish “Running Flag”, meaning an upwardly skewed Flag that is still forming. If this interpretation is valid – and the positive volume pattern overall suggests that it is - then the price is now very close to the lower boundary of the Running Flag and therefore at a good entry point. The reason that the Running Flag is so bullish is that it indicates that the primary uptrend is so strong that it has the effect of skewing the Flag to the upside. If that is what is going on here, then not only are we at a very favorable entry point close to the lower boundary of the Flag, but an upside breakout will lead to another very strong move similar in magnitude to the one leading into the Flag. It is therefore considered to be a good time to BUY BACK WHATEVER STOCK WAS SOLD AT THE RECENT PEAK at the point shown on the chart, and new purchases here are in order. Should we see a deeper reaction across the sector there is some risk that Tanzanian Royalty breaks down from this pattern and drops back to the support level shown on this chart. To limit loss in the event of this happening a stop may be set at say $0.544. However, the earlier price / volume pattern is very bullish, making it much more likely that it starts higher again from here. Tanzanian Royalty Exploration Corporation, TRX, TNX.TSX, trading at $0.59, C$0.76 at 10.10 am EST on 22nd February 19. Posted at 10.35 am EST on 22nd February 19.